Mount Etna, treks to the top are available and worth it. We have traveled in Italy many times. Sicily is one of the highlights of the country not to be missed. Our first trip was in 2000 and we returned in 2003, saw even more, enjoyed it all again and vowed to return yet another time. 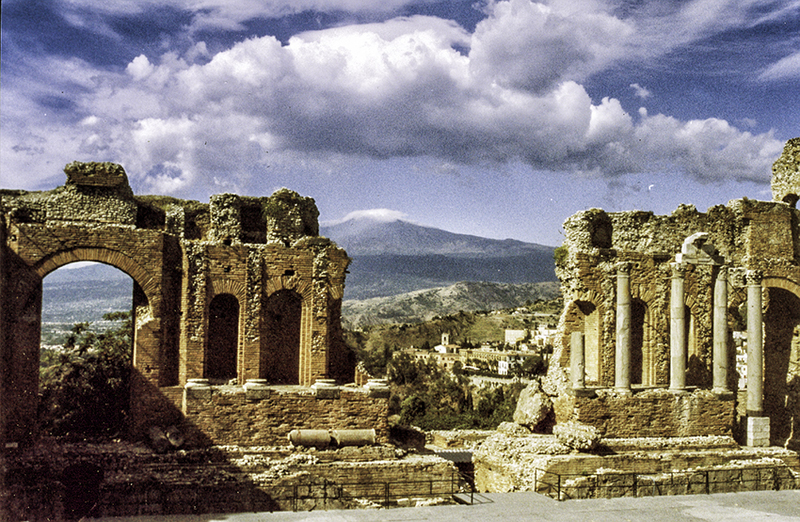 A trip to Sicily is always in the planning stages in my mind. Getting to Sicily by car is relatively easy in terms of the water crossing. It is a much longer drive than we expected to drive down from Rome. The drive from Rome to Villa San Giovanni (ferry port to Sicily) takes more than a day. Plan to stay one night on the way down. That is how we discovered the town of Tropea in Calabria. Never have regretted that! Don't worry about ferry reservations other than if you are traveling in August. It seems there is a ferry of some sort leaving almost every 20 to 30 minutes. Our wait was relatively short. The ride over is about 20 minutes. The primary sight is the Valle dei Templi, the collection of temples on a ridge just outside of the town. There are eight temples (and various other remains) built between about 510 BC and 430 BC: the Temple of Hera, the Temple of Concordia, the Temple of Heracles, the Temple of Olympian Zeus, the Temple of Castor and Pollux, the Temple of Hephaestos, the Temple of Demeter, and the Temple of Asclepius (the God of Medicine). The most complete is the Temple of Hera and the Temple of Concordia. The Temple of Heracles is the oldest. There are only nine columns still standing but you will find this one most impressive as they are tall columns and you easily get a sense of the size of the original building. The four columns of the Temple of Castor and Pollux are famous as they are some of the photographed works of the site. Known by many names, Akragas by the Greeks, Agrigentum by the Romans, Karkint by the Arabs, Girgentum by the Byzantines, Girgenti when Italian replaced Latin in Italy and finally in 1927 changed by the Italian Government to be known as Agrigento. Founded in 582 by the Greeks it was at one time of the most stunning cities in the ancient world. You won't be dissapointed. As you walk through the remains you will feel that lump in your throat, you will get a sense of how little time we represent and you will be in awe of Agrigento. This is the mother-load of ancient buildings. As I don't think there is another single location that provides the number of arrow of buildings and ruins. 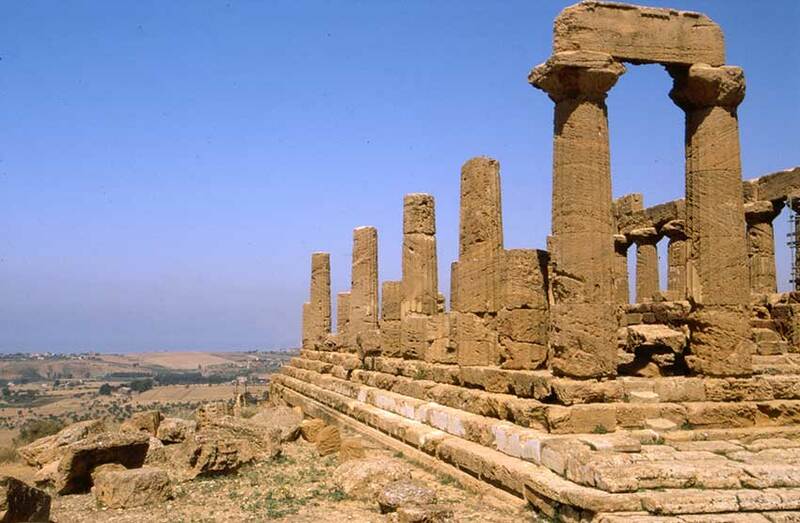 Agrigento has the impressive Valle dei Templi and numerous temples and other architectural sites. It was much more than we expected. At one of the main location a road leads from the parking lot. You walk along an ancient Roman wall past impressive temples. Some relatively intact. 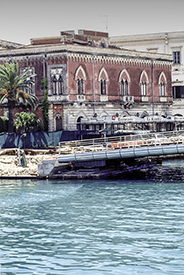 When you land on Sicility by ferry you can turn to your right and drive towards Palermo or go to your left towards Siracusa. 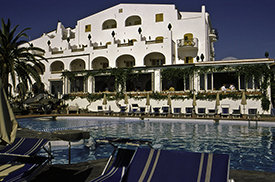 If you head left, then make your way to a great hotel at Giardini-Naxos, just past Taormina. Our stay at the Arathena Rocks Hotel was heaven! See our comments on Great Places to Stay. We used Giardini-Naxos as our base to travel to Taormina, Siracusa and Galtagirone. The town of Giardini-Naxos itself really did not do that much for us. The setting is great. The town is along a long curving bay. Hotels are cheaper here than in Taormina. It is just a few minutes up the hill to Taormina. 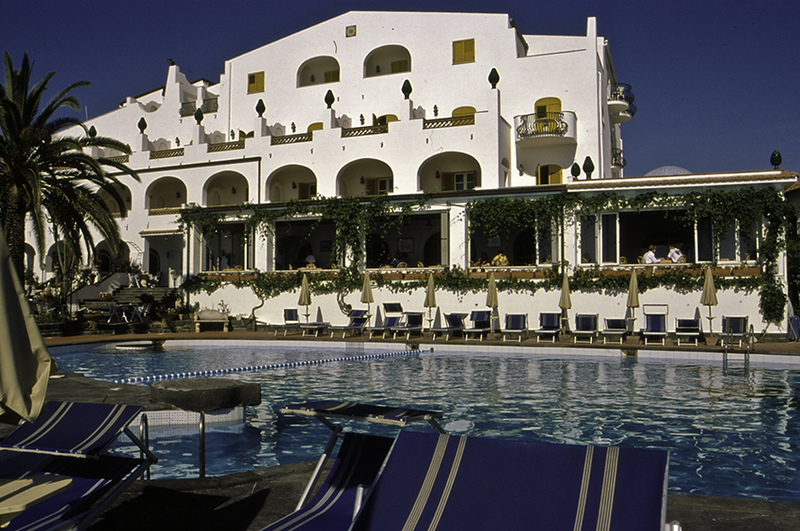 Staying here was a highlight of our stay in Sicily. A popular destination for tourists, and then the cruise ships dock in the port, the busses bring throngs of visitors to the city. It is very pleasant. One of the attractions is the is the Greek Theatre. The Doric temples of Segesta. It is thought to have been built in the around 420 BCand designed by an Athenian architect. Located about 43 miles from Catania, is is a centre of pottery and maiolica and terra-cotta wares. Walk the stairs of the streets. They are lined with colourful tiles. The city is noted for his Greek history, amphitheatres and architecture. 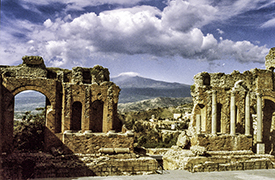 It is one of the most scenic towns in Sicily.You will love the feel of the city. There are large ruins outside the city. Grand architecture in the city. We are lucky we have what we have as the city suffered from earthquakes in 1542 and 1693. In 1870 the walls of the city were removed and a bridge connecting the city, which sites on the Island of Ortgia, was built to connect the city to the mainland. Taormina is one of the most pleasant town in Sicily. It thrives on international tourists. The cruise ships anchor in the bay below and the buses bring travelers to the town for the day. But don't let that stop you. The town is not full of the merchandise that haunts many tourist locations. You will fine a town with plenty of charm. Dominated by Arabians from the 9th to the 11th centuries the architecutre that remains is interesting. It was during the 1lth century the Arabs reinforced the city's defences by building, among other things, a tower which is the main part ofthe Palazzo Corvaja. 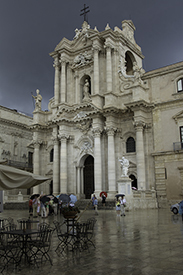 The Spanish, while they ruled, chose Palazzo Corvaja as the seat of the Sicilian Parliament. Corso Umberto I, the main street, runs from Porta Messina to Porta Catania. Along it is a line of 15th and 19th century palazzi. There are plenty of good shops. Gelato. Restaurants. You can see Mt Etna from the town piazza. One of the attractions is the Greek Theatre. It now is the place of plays, fashion shows, concerts, and cinema festivals. The Teatro Greco dates from the 3rd Century BC. It was small when originally built, and the Romans enlarged it to accommodate their own theatrical events. Great views from the theatre Mount Etna and the Bay of Naxos. The Odeon is located in the middle of the old Roman town, below Palazzo Corvaja. A small theatre, built by the Romans about 21 BC. Corso Umberto I is the main street through the town. 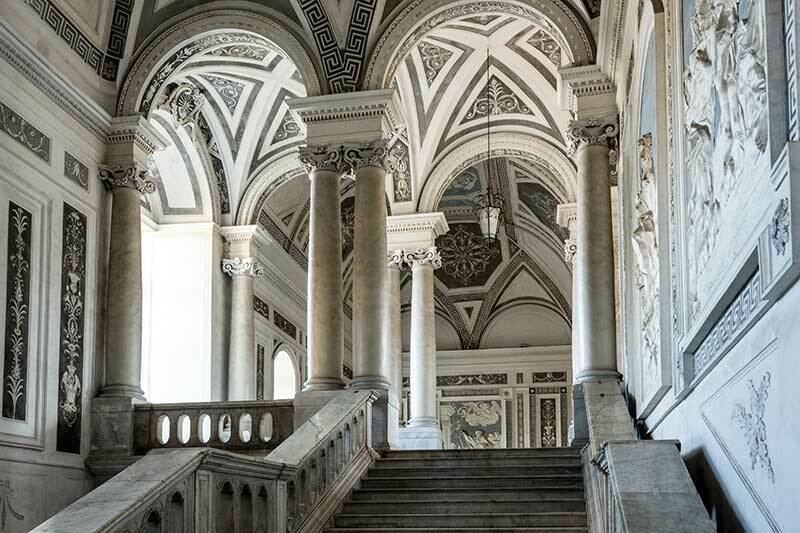 The Palazzo Corvaja has architecture that reflects Arab, Norman and Gothic influences. The original tower was built by the Arabs. Later, in the 13th Century, the Normans built onto the tower adding a wing. Then in the 15th Century the Spanish added another wing to house the Sicilian Parliament. For a time, just before World War II, Palazzo Corvaja was a house for poor families. But after the War it was restored and in 1960 another section was added to house the local tourism offices. Thre is a cable car to take you to and from the seaside resorts. We drove, and parking is is designated lots outside the centre of the city. Siracusa has the impressive parco archeologico della neaplis. This contains the remains of the Greek theatres and some extensive quarries. On our 2000 trip we mainly spend time in the architectural ruins. But don't miss the city. We concentrated on that on our 2003 visit and it is well worth a good day of your itinerary. The archaeological site is northwest of the centre of town. Of note is the Greek amphitheatre dating to the 5th Century BC. Its cavea is amongst the largest ever built. There are 59 rows and with this, the theatre could accommodate up to 15,000 spectators. An annual Greek theatre festival takes place from the middle of May to the end of June. Personally, I preferred visiting the temples in Agrigento more than this site. The old stone quarries (latomie) are over the ridge from the theatre. The “Ear of Dionysius”, is a 20m-high, slender pointed arch cut into the rock face that develops inwards for about 65m. The name dates back to the 1608 visit by Caravaggio. The legend is that it was used by Tryant Dionysius to be a prison for his enemies. The excellent Cathedral-like acoustics meant that he could hear their conversations from outside. The Roman amphitheatre, 3rd Century AD, is one of the largest. The Archaeological Museum, located on via Teocrito, is outside the archaeological park and holds exhibits from the Syracuse area. 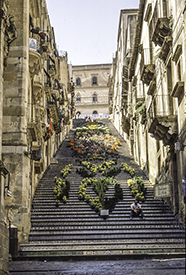 From Syracuse you can travel to the Island of Ortygia. It is small, 1km by 500 metres and has Greek and Roman remains, Mediaeval Norman and Baroque architecture. There are trattorias and bars. Cross the bridge from the mainland. On the western side is the fountain of Arethusa. There is also the remains of the Temple of Apollo built in the 7th Century BC. 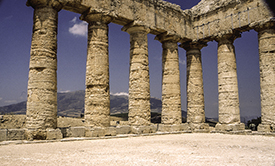 This ws the first great Doric temple of its kind in Sicily. The Corso Matteotti leads to the Piazza Archimede. The centre of Ortygia is the Piazzo del Duomo. The Cathedral is built on the site of an ancient Temple of Athena and the original Doric columns are built into the building. On the Piazzo del Duomo is the baroque-styled Palazzo Beneventano and the church of Santa Lucia. The market is to the left when you cross the bridge and in the morninging there is an array of fruit, vegetables, fish and meat. The shop at the end of the market, “I Sapori dei Gusti Smarriti” which mens flavours of lost tastes has cheeses, cured meats, wines, and other Sicilian delicacies produced by the shop owner. There is a maze of streets to walk and eventually you will reach the Castello Maniace, a bastion built by Frederick II in 1239. Caltagirone is a beautiful town known for its Baroque architecture. We had a great lunch. Climbed the scala di Santa Maria del Monte and shopped for ceramics. The Duomo in Catania is very impressive. It is a city alive, the main piazzas are a buzz with activity. Pleasant bars are found on some of the main streets. The Benedictine Monastery, one of the largest in Europe, is like a palace, there were close links with the Benedictine monks and the Catania nobility. It is now the Faculty of Literature and Philosophy for the University of Catania. 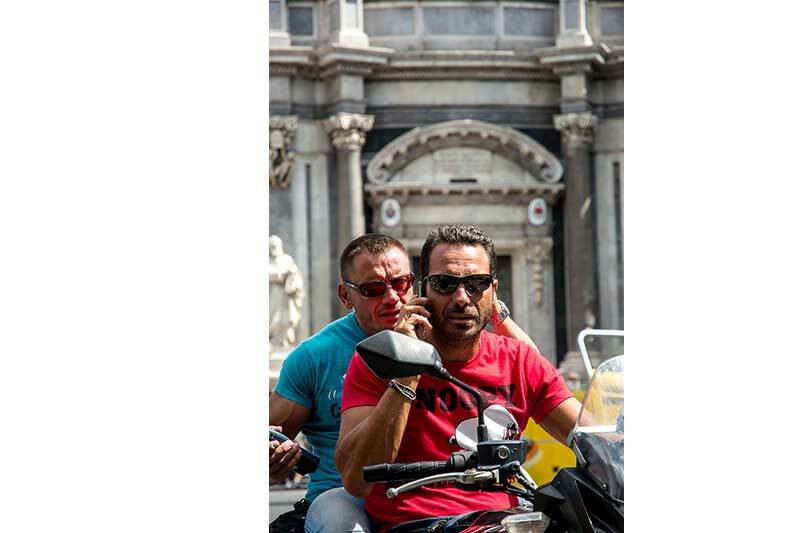 We have previously thought of Catania as just a big city in Sicily. On our 2013 trip we planned to stay near Catania, but really did not have the plans to spend much time in the city. 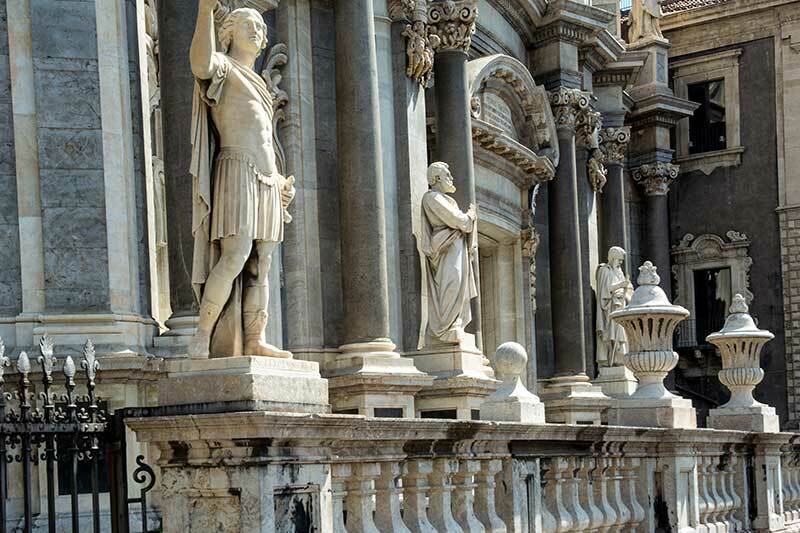 When some last minute changes occured, we thought we should spend a day or so in Catania and we booked into the UNA Palace Hotel right in Catania and it verified our thoughts: if you want to see a city, stay in the city. Segesta includes an impresive Doric temple and a theatre high on the hill overlooking the remains of the ancient city. The temple looks perfect. Only the roof is missing. It was actually never finished. Started in 424BC, it stands unfinished. It is a long, long twenty-minutes walk up the hill to the threatre. There is a bus that, when it is working, shuttles tourists from the bottom to the top of the hill. The walk, however, is worth it. Take you time, enjoy the views, look back the temple. I was a bit worried about going into Palermo. Too many tour books had reports on street crime. Well, it took some pressure from Karen, but we went to Palermo and enjoyed every minute of the place. Yes, I actually drove through the city in search of a hotel. Once I found one I left the car and we used buses to travel any of the long distances. I had heard the stories about how Palermo was still a bombed out city from the War. Not so, yes it was bombed in the Second World War. And yes, there are some areas in Palermo that have not been rebuilt. But don't go these expecting to see a ruined city. Not so. The Cathedral of Palermo is a very different looking building from what one may expect. There is a variety of styles of architecture that result from manyyears of additions and restorations. An interesting feature is the heliometer. This is a (solar observatory built in 1690. A small hole in one of the domes allows light in, creating an image of the sun on the floor at solar noon: 12:00 in winter and 13:00 in summer. A bronze line, la Meridiana, runs along the floor in a precise North/South Direction. The ends mark the positions as at the summer and winter solstices; signs of the zodiac show the various other dates throughout the year. San Giovanni degli Eremiti datesfrom the 6th Century. It was restored in 1880. The pink domes show the Islamic influence. More information on the Travels to Cloisters Site. There are a number of markets in Palemo and to walk the narrow streets with the tents and the crowds is the best way to get the Palermo Feel! Not far from the Martorana Church and Quattro Canti is the Ballarò market. This market goes from the Piazza Ballarò in the Albergheria district (near the church of San Nicolò) along Via Ballarò past Piazza Carmine toward Corso Tukory, roughly parallel to Via Maqueda toward the main train station. 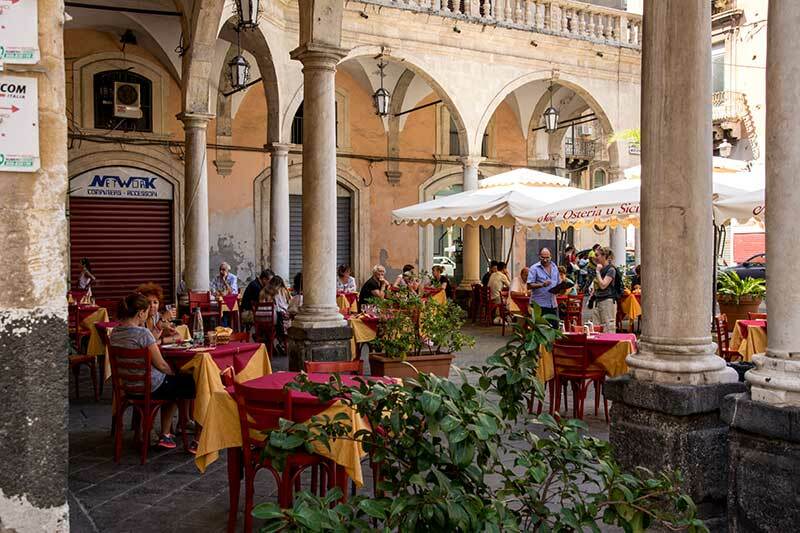 The Capo Market is located behind the Teatro Massimo, and it fruns from the Via Porta Carini off Via Volturno near the old city wall toward Piazza Beati Paoli. Parts of this market include much more than food. Vucceria Market begins at Piazza San Domenico, off Via Roma and goes along parallel to Via Roma - although you can not see it from Via Roma towards Piazza Caracciolo and Corso Vittorio Emanuele. The markets are typically open from 9 in the morning until 7 at night. On Wednesday they close early, around 2 PM. They are closed on Sundays. I was on the search for some great pen stores. I found a number of great stores. The city was wonderful. The architecture and endless sight. In fact, we're going back. 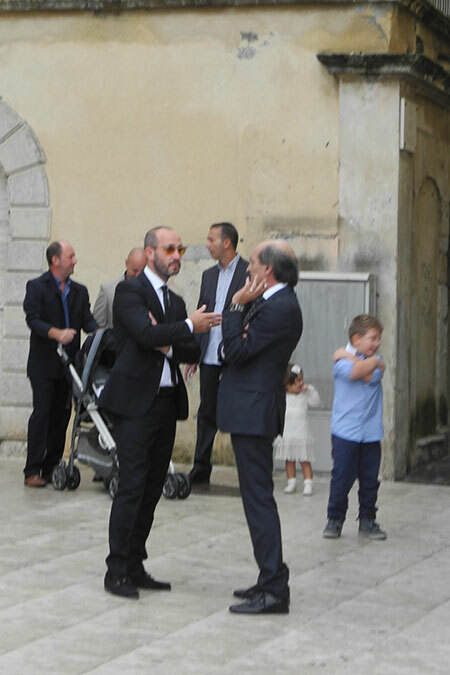 Be sure to visit La Martorana - there will most likely be a wedding going on as it is the place to have a wedding in Palermo. The architecture of this church is very impressive and somehow, despite the tourists walking through the church, there is a regular schedule of weddings that take place. Inside there are 12th century mosaics by Byzantine artists. Just outside of Palermo is the town of Monreal. The view from "Royal Mountain" is reason enough to travel to the town. But there is more. The Normal Cathedral, although plain in appearance on the outside, offers the most extensive medieval mosaic work in the world, on the inside. The Chiostro dei Benedettini, or cloisters, entered from the side of the church, are impressive. There are some 216 twin columns reflecting the Arab influence in Sicilian art. No two columns are the same. Some stops are not planned. They just happen. We were tired, we need a place to rest. We came across San Vito Lo Capo and enjoyed every minute of the place. The small town is on one of Sicily's finest sand beaches. It is a resort town. There is lots of life for the evening promenade. Just walk up and down the Via Savonia, take in the sites and sample the great gelato. What more would one want? When in San Vito Lo Capo take a boat tour along the cost of the Riserva Naturale dello Zingaro. This is a natural reserve with a stunning coastline and aqua blue water. We joined six others on a small boat and had one of the most enjoyable days of the trip. We traveled along the coast, pulled into small coves, dove from the boat and swam. Wonderful. Vito at the Riva del Sole looked after our arrangements. The Riserva is the first natural reserve Sicily established. There are seven kilometres of unspoiled coastline protected by steep mountains. This is one of the largest and most impressive archaeological sites. Some consider this to be equal to anything found in Greece - having not been there, I canèt comment on that. but we did enjoy our visit here. Abandoned for over 2,000 years the numerous temples, acropolis and agora are lie in various states of ruins and you do get a sense of awe walking around the site. This was one of the major cities in Magna Graecia. It became a large expanse of rubble as a result of an attack from the Carthaginians.They sent a group of 100,000 men to finish the town off. They did in nine days. The 16,000 or so were killed or taken into slavery. Located 10km to the east is the Cave di Cusa. This quarry remains as it was 2,000 years ago when Selinunte was sacked and the stone masons fleed. They left enormous, half-extracted pieces of column cut directly from the rock. It shows how the temples at Selinunte were built and how the local craftsmen and engineers constructing the masterpeices. 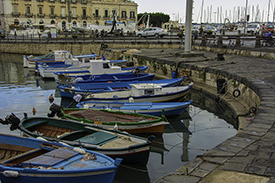 Located on the western tip of Sicily, Trapani has always been an important port, with a heavy emphasis on salt, wine and tuna. We were only here for a short time and it was outside the town to see the salt flats. The town hya some major urban sprawl. Get through that and the histortic centre is more interesting. Also the Egadi Islands are just off Trapani. Go down the main Corso Vittorio Emmanuele as the street is flanked with numerous buildings displaying the impressive Baroque style of architecture. If you along the seafront boulevard, lunomare Regine Elena, it takes you past the port and you can see some of the salt flats. Out in the sea are the Aegadean Islands. We drove out to see the salines -- or salt flats. They are a series of small pools or ponds that take in water from the sea. This area of the Mediterranean has virtually no tide variance. So, the water comes in, sits and then is pumped into successive pools. Windmills drive the pumps. As the water evaporates the salt crystals form. They are then shoveled into small piles. Left for drying. A short stop in a fish market in Trapani really brought out the feeling of life in Sicily. The air was abuzz with fish vendors all yelling out how their fish was the best. Customers, shrewd as ever, had their own comments and the price bartering and selection seemed to go on forever.